Williams was one of very few African American photographers working on the jazz scene at that time and as such, gained rare access allowing him to capture stunning candid images of some of the world’s most famous musicians as they made musical history or relaxed behind the scenes. Most of Williams’ archive, comprising both original negatives and photographs, has never been published, printed, or seen before – until now. His jazz photography has been widely celebrated for the way in which it takes viewers on a heartfelt journey into both the on- and off-stage lives of touring, hardworking and legendary jazz musicians. His work demonstrates an intimacy and spontaneity toward his subjects and it is in that dynamic where the honesty and truth of his photos are to be found. An innovation in online galleries, Storiesonwalls.com offers fans engaging mini-documentaries that tell the stories behind iconic or rare images. Every image is available to purchase as limited edition, gallery quality prints, which can be shipped globally. Through this exhibition, jazz fans can discover the intimate details or funny anecdotes behind each image, as remembered by the photographer. And now for the first time, fans have a chance to own these unique and intimate shots of their favourite jazz musicians. Each image is 594mm X 420mm printed on Hahnemühle Photo Rag fine art paper and comes in an edition of 300 costing £175 unframed or £350 framed. Williams’ work emanated an intimacy and spontaneity towards his subjects and it’s in that dynamic where the honesty and truth of his photos is to be found. William’ longer-term ambition had been that the general public would get to see his images in exhibition settings. In this way, Ted believed that the photographs would offer some illumination on mid-twentieth century African-American culture. Stunning photo's but, looking at the above shot, going by the set-up of the pieces I think I think Diz is about to get checkmated! 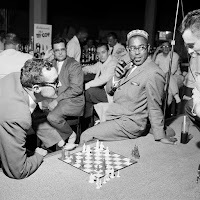 Years ago, I remember a photo in MM of Dizzy and Ronnie [Scott] playing chess - I wonder who won?